The second book in a funny chapter book series filled with full color illustrations and adorable animals! The Grumpy Woods dislike Wallace Woodpecker only slightly less than the Super Happy Party Bears. They find his pecking preposterously loud, but the bears think Wallace is beating a nice rhythm--it's great for early-morning dancercise! The bears convince Wallace he has great skills to offer the woods, and they give him ideas for unsolicited handy work. Instead of endearing him to the neighbors, it annoys them even more. Can the bears really help this noisy neighbor? 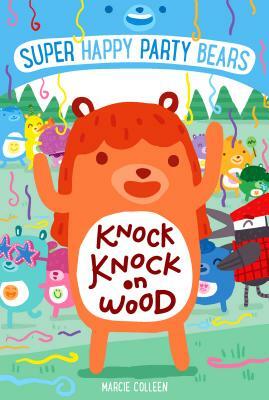 Marcie Colleen is the author of the Super Happy Party Bears picture book series, illustrated by Steve James. She’s a former classroom teacher and current Educational Consultant for the Picture Book Month initiative. In that role, she presented at a recent New York Public Library Literary Salon, which focused on the Common Core. She also creates Teacher’s Guides for picture books and middle grade novels and is a huge advocate for using children's fictional literature in the classroom. Steve James has ten years work experience in the art industry (animation, greeting cards and video game artwork). Super Happy Party Bears is his first children’s book. Steve’s art is influenced by Adventure Time, Oliver Jeffers and walks in the countryside. He lives near Leeds, a vibrant city in the United Kingdom.